San Diego, CA – The 2012 Presidential election lived up to the hype as one of the more polarizing elections in political history. The ups and downs of debating, campaigning, gaffing, 47%-ing, and polling helped create some of the most entertaining democracy of all time. Business as usual will continue for President Obama, but the Observer was left to wonder how Mitt Romney is coping after the election. FM Observer: Hello, Governor Romney. Thanks for taking the time to sit down with me. Mitt Romney: Oh, ha ha. You’re welcome. You can call me Mittledon. MR: Yes, Mittledon. It is my given name. FMO: Ok…Mittledon… Thank you for having me. Now that the campaigning and election hoopla is over, how are you and the Mrs. spending your time these days? MR: Ann and I are fine. We have been fine and will be. Ann enjoys to snippet pictures of reasonably-priced goods from newspaper mailings. I have taken up the hobby of the reading of web publications. FMO: So, Ann clips coupons and you are an internet addict? Is that accurate? FMO: Hm. Lovely. Is this retirement? Are you effectively retired from your work as a politician? MR: Ha ha, not entirely! I will still consult for the office of Massachusetts Governor as a private consultant. Ann with her charitable work. I also spend time with my many children, Tagg, Batt, Rigg, Mock, and Fudd. FMO: Are your children getting into politics? FMO: (confused)…uh…ok. So, tell me, your work as a private investor has proven to be a very successful venture. Do you have any advice for young people who want to get into investing? MR: Certainly. I would tell them to make smart decisions for the good of the company you are investing for. Money is a tool, and a very valuable one. The more tools a company has, the more prepared it is to function in an American society. Get your tools, polish them, center them and use them to help the business. Would you like to see my tool collection? MR: (Mittledon leads me into his master bedroom. In it, I am shown a king-sized bed constructed out of laminated $100 bills. It is magnificent.) This is how Ann and I keep our bed at night. MR: I know, it is. I have one just like it back home in Boston. The mattress is stuffed with a mixture of shredded $100 bills and Orca whale blubber. The softest, richest mattress the planet has ever known. FMO: This is just fantastic. You’ve done very well for yourself, Mittledon. 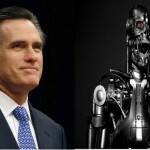 FMO: So what’s next for Mitt Romney? Do you have a 5-year plan in mind? MR: Ann and I will take our time deciding. I suspect I will be called upon to assist with various aspects of political prowess for the Republican party. If so, that is fine. If not, there may certainly come a time in which I will be asked to donate my body to science. Would you like to ask a follow-up question to that statement? FMO: (confused again) Um…sure. (long pause)…Why would you consider donating your body to science, Mittledon? MR: I am comprised of a fusion of mechanic microorganisms and people flesh. There was an experiment done many years ago, well ahead of its time. I am the result of that experiment. Ha ha, but the details of that experiment are for another time. Ann and I thank you, you should go now. FMO: (I lock eyes with Mittledon. I notice a very rapid quivering of his pupils.) Ok, Mr. Romney I thank you for the opportunity!